↑ 1.0 1.1 "Former Afghanistan president Burhanuddin Rabbani killed in Kabul blast". The Daily Telegraph. London: TMG. 20 September 2011. ISSN 0307-1235. OCLC 49632006. Retrieved 22 October 2011. ↑ "Burhannuddin Rabbani: Kabul mourners march as Afghanistan faces fresh turmoil". The Daily Telegraph. London: TMG. 21 September 2011. ISSN 0307-1235. OCLC 49632006. Retrieved 22 October 2011. 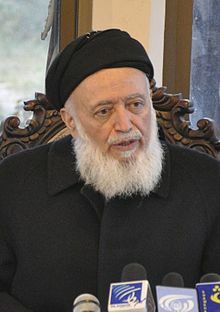 Wikimedia Commons has media related to Burhanuddin Rabbani. This page was last changed on 25 June 2018, at 19:44.